As we get nearer to the Chelsea Postgraduate Summer Show, it is important to highlight the other accomplishments our MA students have achieved throughout their studies at Chelsea College of Arts.MA Textiles Design student Tanya Kancheva took part in the I-SKOOL Academy Denim Competition, organised by the Italian company ISKO. IKSO, a part of SANKO Group, is the world’s leading denim fabric producer. Five different colleges were involved in the competition, including Chelsea College of Arts. The strength of the I-SKOOL project lies in its collective approach and in the focus on the operational actualization of creativity, leading students to be able to industrialize their ideas coming to the final garment. Chelsea College of Arts had four finalists in the competition, and Tanya won the Fashion Mood category with her project: ‘Illuminati – Celebrities without faces’. She describes her project: “Designing a fashionable denim overall has arisen to me not only as part of my own feeling for aesthetics and beauty, but as my desire to create denim garment in the most sustainable way possible with a touch of history and vision for the future. Inspired by the Illuminati secret society, celebrity’s style and popular culture, my denim outfit aims to show and hide the lady’s body in the same time. 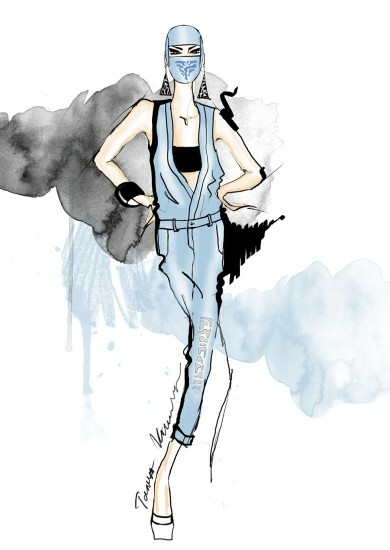 The concept aims to reveal new approach, focused on the timelessness of the denim overall. While I was working on the concept, I had one major mission – to catch the “Youth code” but to keep the classic look on the edge. We congratulate her on winning her category and look forward to seeing more of her work in the Postgraduate Summer Show.